Neil Tennant has acknowledged that the Pet Shop Boys’ new album will come as something of a relief to the band’s fans, after their most recent efforts diverted from their much-loved disco anthem sound. The Pet Shop Boys’ mastery of this particular genre has resulted in 50 million album sales, including a catalogue of hits including ‘West End Girls’, ‘Rent’ and ‘Go West’. For their 12th studio album, ‘Electric’, they’ve turned to the talents of master-mixer Stuart Price, the man who put Madonna on the dance-floor for the ‘Confessions’ album. “I’m not a purist, but you could call it purely electronic,” muses Tennant of the new sounds. Despite his reading of what fans want from the band, Tennant is too experienced of the wiles of the music industry to be defined by it. And when they get to the top of the mountain what happens? “You get to the top of the peak and discover all the other peaks. It’s like Shangri-La,” reports Tennant. 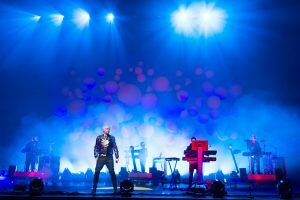 He cites two moments in the Pet Shop Boys’ own creative life as living up to that and, excitingly for fans, one’s from the new album – “pure ecstasy” – and then digs into their back-catalogue for the other.